Tanzania is synonymous with the Great Migration, and with careful planning, it is possible for visitors to be at the right place in the Serengeti to witness this amazing annual wildlife event. The Serengeti - synonymous with the Great Migration that takes place every year. 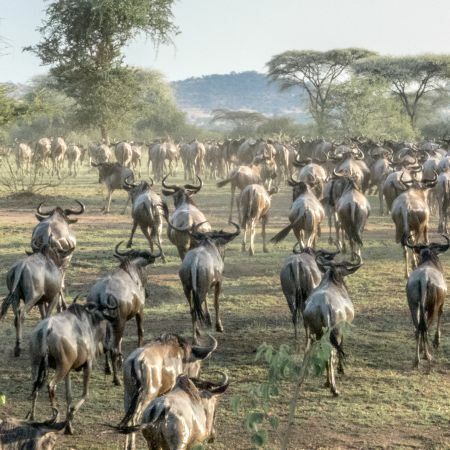 Literally millions of wildebeest, and thousands of zebra and gazelles, trek hundreds of miles across the vast plains of the Serengeti in their quest to find water and richer grazing land. But the game viewing here is not only just about this naturally occurring phenomenon. 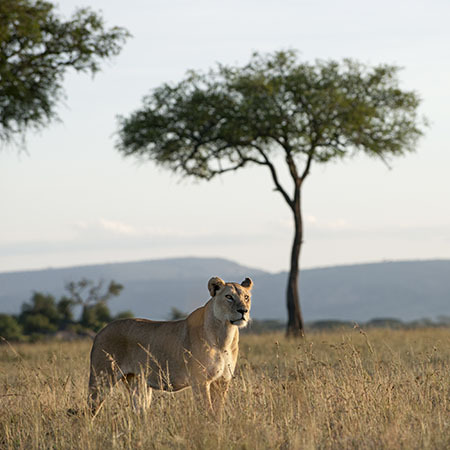 The Serengeti also offers what many people consider to be some of the best game viewing in Africa. Large herds of buffalo, thousands of antelope such as eland, impala, gazelles, topi and kongoni, and family groups of zebra and giraffe are closely watched by eager predators such as lion, leopard, cheetah and spotted hyena, who are always on the look out for a quick and easy meal. Rhino, elephant, giraffe, jackal, aardwolf, porcupine, warthogs, baboons, vervet monkeys, serval cats and hippo are just some of the other 70 mammal species that call the endless rolling Serengeti plains 'home'. Black eagles soar on the thermal currents, circling around in search of lizards and rock dassies to swoop down upon. Secretary birds strut across the short, shimmering grasslands, and ostriches, with their ungainly gait, run around for no apparent reason. Over 500 bird species have been recorded here, making this a bird-watchers paradise too. The Serengeti National Park covers just over 14,750 km², and as well as being a World Heritage Site, it is also one of the largest National Parks in Tanzania. For obvious reasons, it is also the most visited. However, despite the number of safari goers that flood here every year, because of the sheer size of the Park, you can still find yourself being on the only game viewing vehicle for miles around. 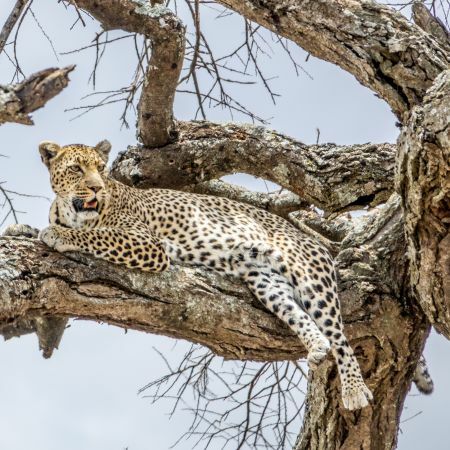 © Travel ButlersThe Park consists of not only wide open plains which most people automatically associate with the Serengeti landscape, but also hills, valleys, rocky outcrops known as 'kopjes' (pronounced 'copies') and a number of rivers - making it also a very scenic safari destination. The rivers in the Serengeti are mostly seasonal, but the Mara River in the far north and the Seronera River in the central plains contain water year-round, making these areas particularly game-rich. The Park is divided into 5 main areas - the Southern Serengeti Plains, where about 2 million wildebeest and 300,000 zebra congregate from December/January onwards to give birth prior to the start of their migration northwards; the scenic south-western Moru Kopjes area; the central and easily accessible wide, open grassy plains of the central Seronera Valley and Seronera River, which offers good game viewing all year round; the Western Corridor - home to the trecherous Grumeti River, which the migrating herds have to cross whilst desperately trying to avoid the snapping jaws of hungry crocodiles; and the extremely remote and therefore relatively unvisited northern reaches, that stretch right up to the border with Kenya and the Masai Mara. © Travel ButlersSafari goers can book a private 4x4 safari vehicle complete with your own highly experienced driver-guide, which is ideal if you want a more private safari experience, travelling in a larger group or if you are visiting more than one area, or there is also the option for a fly-in safari, which is advised if you are tight for time and the more convenient way to travel if you want to visit one of the camps in the remote northern reaches of the Serengeti. There are a wealth of luxury Serengeti safari lodges and elegant camps to choose from, and you can either decide to stay in just one place, or many people combine a stay in 2 or even 3 lodges and camps in each of the different areas of the Park. If you want to follow the migration closely, staying in a mobile tented safari camp would be recommended, as the location of the camps is only decided once the migration is in full flow. A Serengeti safari will generally include daily game drives with your professional guide in closed-sided vehicles (many people choose to head out after an early breakfast with a picnic lunch to really maximise their time game viewing or you can choose to do morning and afternoon drives only and return to the comfort of the lodge for lunch and a brief siesta!). No walking safaris are allowed in the Park (there are a few exceptions to this rule, however, which is where a particular lodge is situated in a private concession area). As well as a safari in the Serengeti, you can also combine a stay here with time in some of the other destinations on the well-travelled Northern Safari Circuit, including Ngorongoro Crater and Lake Manyara, or the Tarangire National Park. Serengeti Simba Lodge is set on top of a rocky outcrop (kopje), offering stunning views over the endless Serengeti plains. All rooms are beautifully and simply decorated with local fabrics and hardwood furniture. Set high on a ridge offering panoramic views across the Serengeti Plains, Serengeti Serena Lodge has been designed to blend completely into the landscape. A series of traditional domed rondavels, each with a private balcony, are widely spaced throughout the grounds. This elegant tented camp is located on one of the main annual migration corridors in the Serengeti National Park. Reached by winding stone paths, each of the 16 spacious tents have a private terrace furnished with both safari chairs and sun loungers. Situated in the Western Corridor, the luxurious safari-style tents each have a private veranda which works as an extension of your bedroom in the wild. The standard Lodge Rooms also have a small veranda. The main swimming pool is ideal for cooling off after a hot and dusty game drive. Situated in the Central Serengeti area, accommodation is in safari tents, each with en-suite facilities. The tents are large, with insect proof windows, comfortable beds with fresh linens and duvets, and an outside seating area. The campfire is ready every evening for appetisers and snacks before dinner. The Serengeti Ndutu Kati Kati Tented Camp is a seasonally mobile camp, strategically situated in the south of the Serengeti from December to the end of March to enable guests to witness the start of the phenomenal Great Wildebeest Migration.